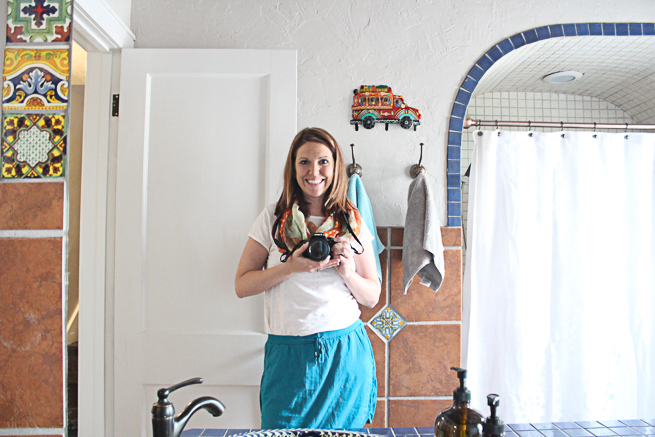 Is it weird that the first room I'm showing on the blog is the guest bath? It was the easiest one to decorate and didn't require too much work. I plan to share with you all more rooms as we get them decorated and organized. 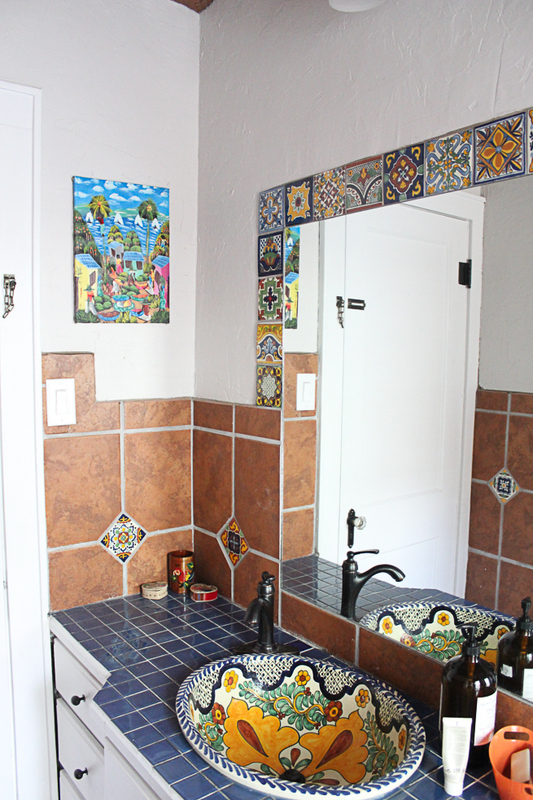 It's fun to see and hear people's reaction to this bathroom. 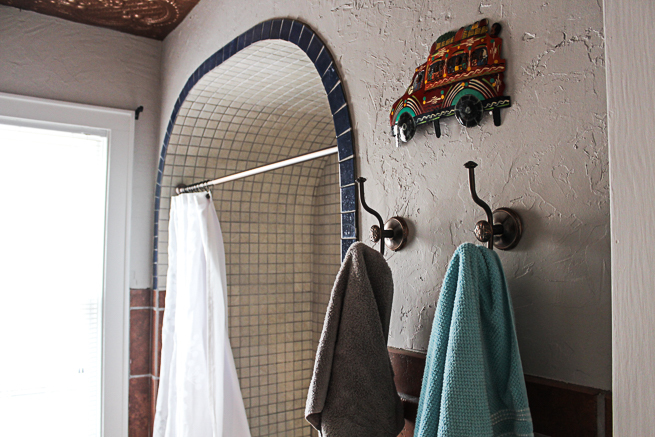 It's kind of a love it or hate it bathroom. Some friends comment on how much they love it and other people have asked why they didn't remodel it with the rest of the house? We aren't offended by people's reactions, it is just fun to see. 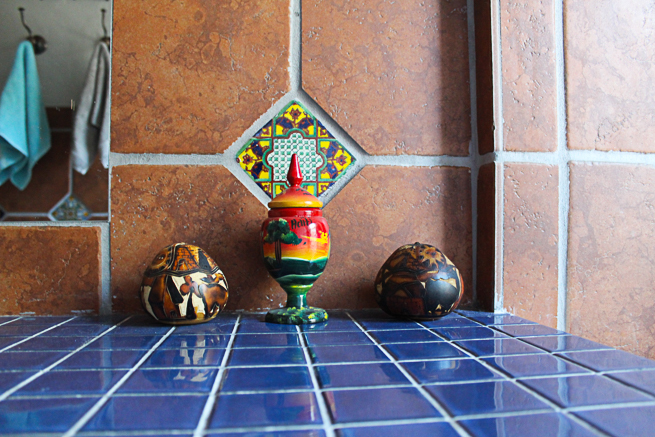 Dave and I both really love it and Dave has art and decor from both Haiti and Bolivia that fits in there perfectly. 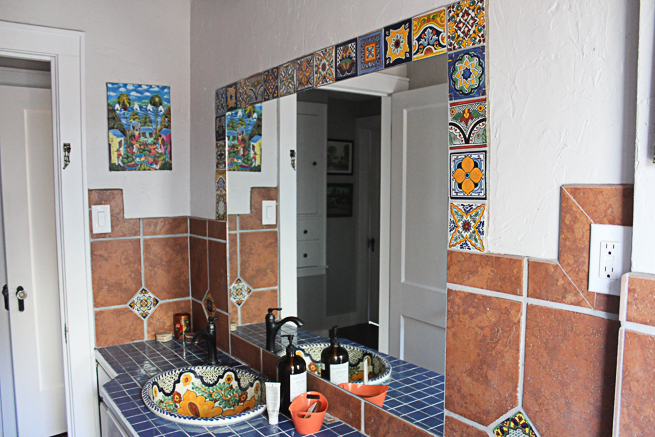 I've nicknamed this bathroom, 'The Spanish Bathroom'. The biggest issue we had was with a shower curtain. 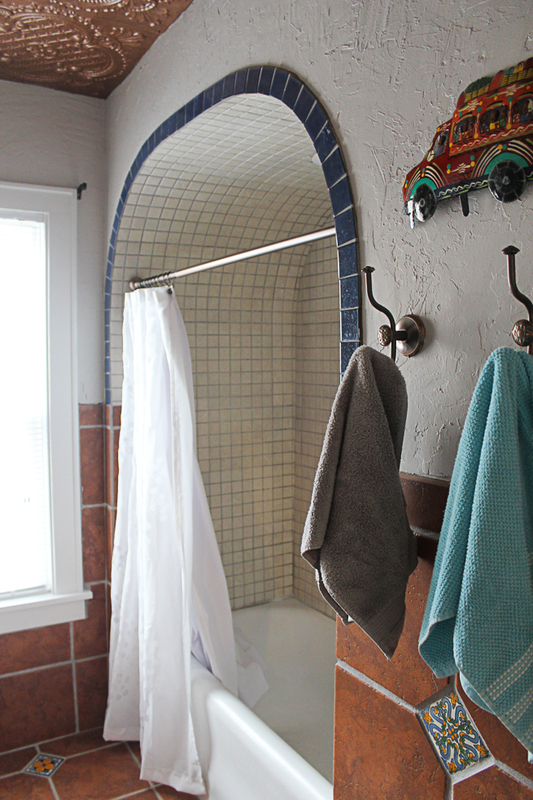 The shower is arched so you have to put the curtain rod lower to get it to stay. 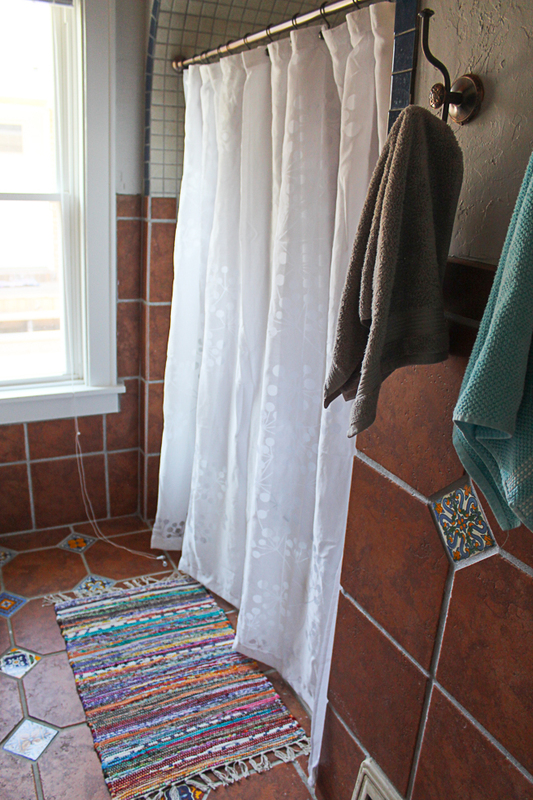 The shower curtain was also way too long with the rod being put low but I just hemmed it up. The carpet was only $3.99 from At Home and it goes perfectly with the theme of this room. 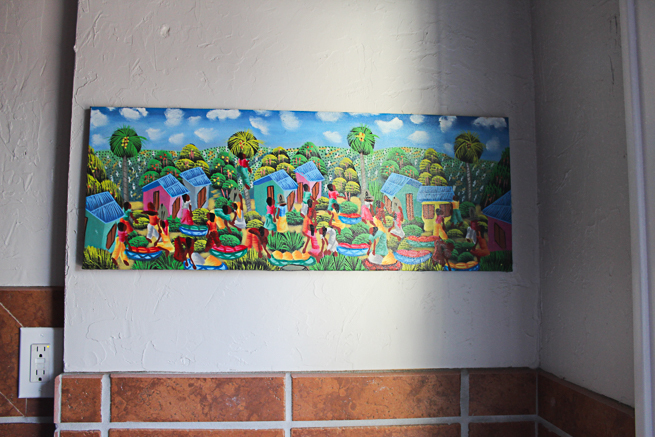 This art is from Haiti and sits right above the throne =). 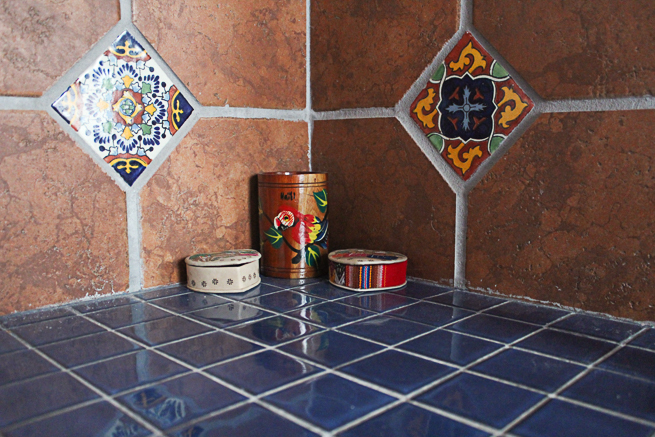 I love the tile in here and the sink is so fun! Isn't this lizard fun? 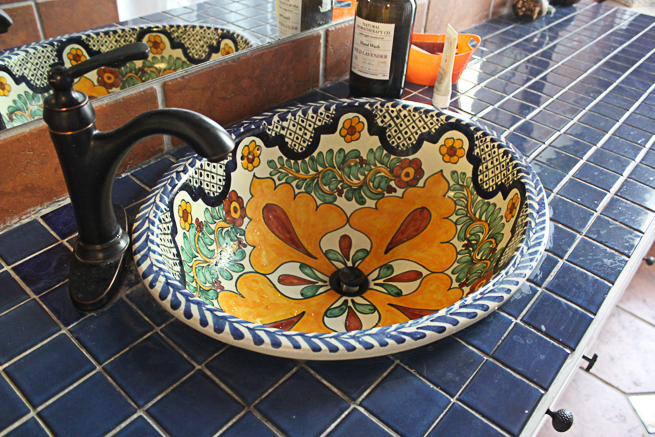 Dave bought it from Haiti and it goes perfectly with the frog handles that the cabinet doors have. That isn't a joke either. 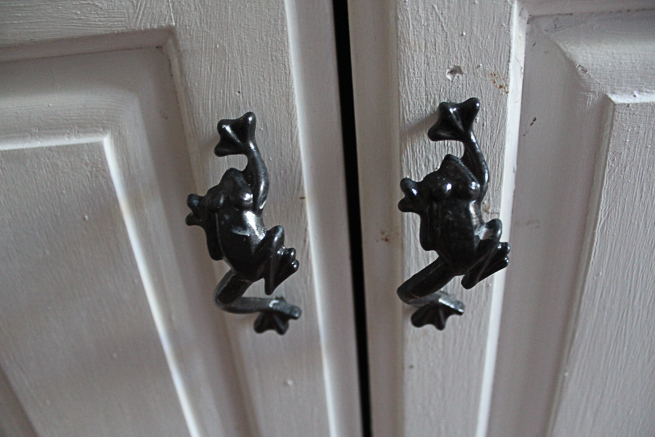 I had no idea that the handles were frogs until after we moved in. I think it's funny (and really weird). 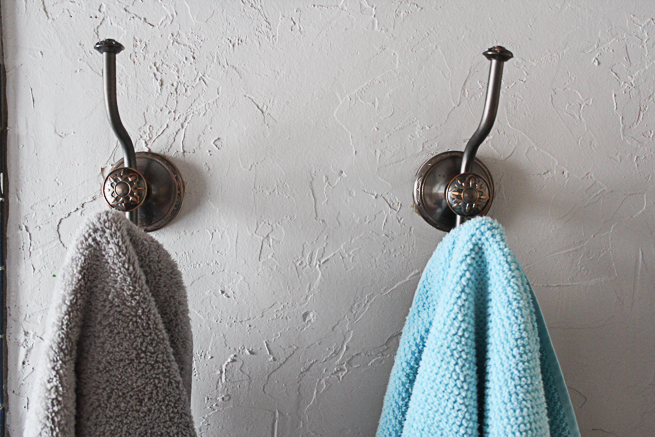 I like these towel hooks too. 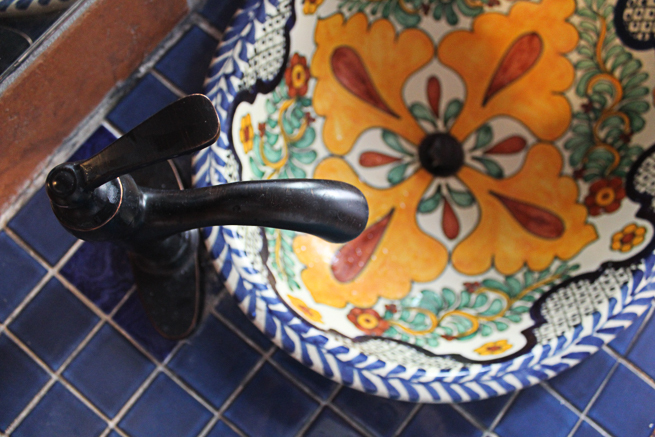 They are a good combo of antique and Spanish looking. 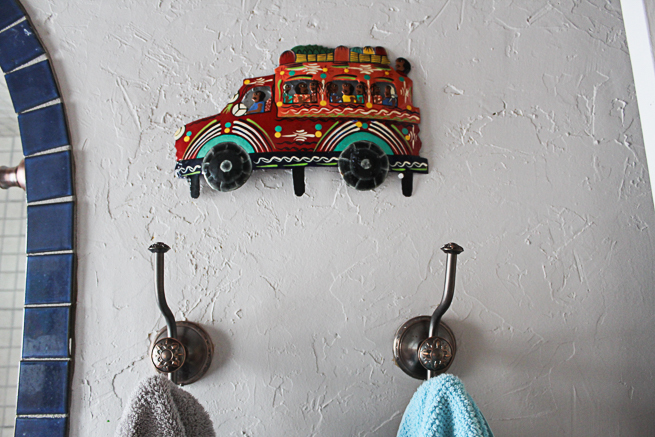 The bus that we hung above these hooks is from Haiti. 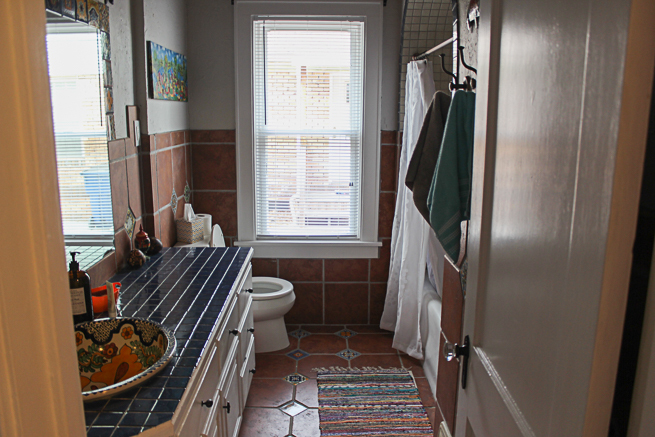 What do you think of this bathroom? Do you like or dislike it? 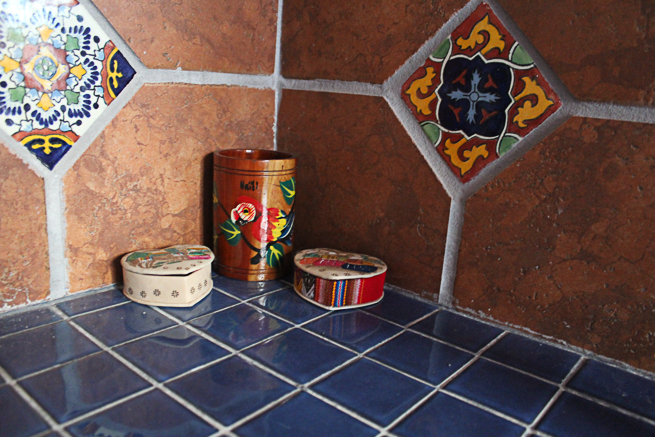 What was the easiest room to decorate in your home? And what was the hardest one to decorate? and i think the bathroom is super fun!! This is absolutely perfect! I love the sink so much. I wouldn't change it! Dying over the lizard. That is the best. 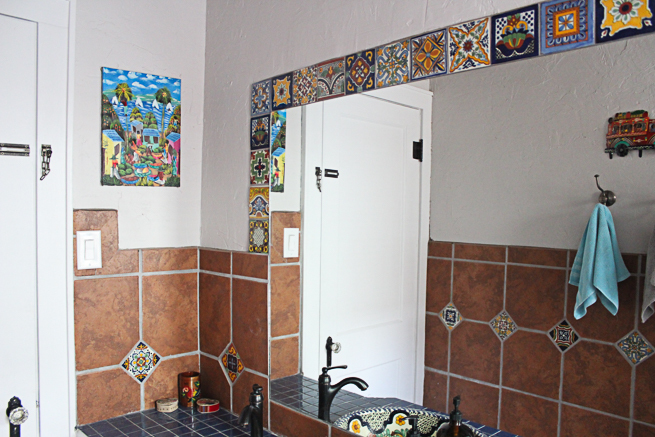 Thinking about your story of how you found this house, it's cool to think about God choosing THIS house for you because that bathroom is just the best :) The art goes great in there! I definitely fall in the "love it" category! It's so pretty and fun! 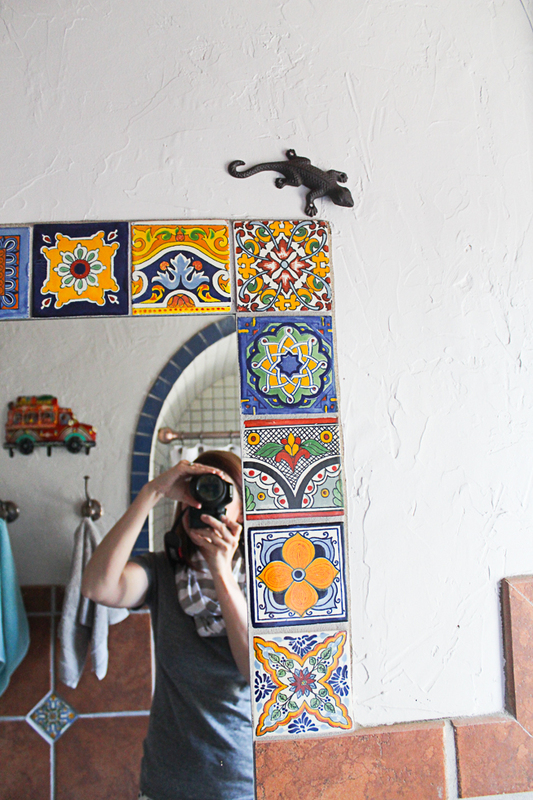 I really, really love this bathroom. It's so perfectly unique and colorful. 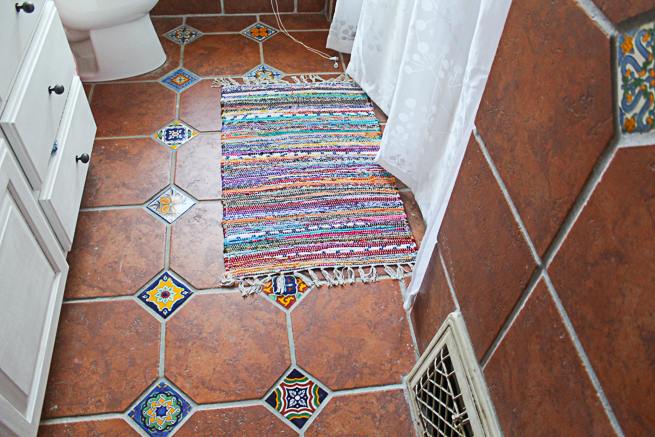 I love detailed tile work anyways and this one has tile everywhere. It does have a different feel from the rest of the house but it's perfect the way it is, and I love the frog handles! I love all of the unique art you have in there! The frog handles are my favourite and I don't think I would have realized they are frogs either if you didn't say anything!